APC reacts to mass defection of lawmakers – Royal Times of Nigeria. 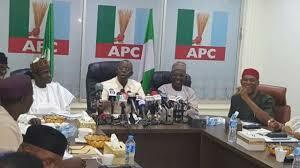 Nigeria’s ruling party All Progressives Congress (APC) has urged its members not to panic in spite of some of the party’s Senators and House of representative members defection to other opposition parties on Tuesday. In a statement by APC’s spokesman, Mallam Bolaji Abdullahi on Tuesday, He urged members of APC to remain calm as they continue to work hard to position the party strongly for the next general elections. Abdullahi assured that the party is still in control, therefore, members should not fidget over the development in the Senate and House of Representative. He added that APC remains in firm control of 25 states of the 36 states of the federation and maintains a clear majority in the federal House of Representatives and state assemblies. He said it would however appear that the individuals involved have different considerations beyond the grievances that they were willing to discuss and which the leaders were willing to address. The party chairman, Adams Oshiomole said he has no fears and believed the party members defection ahead of the 2019 election would enable the party to concentrate on its campaigns.